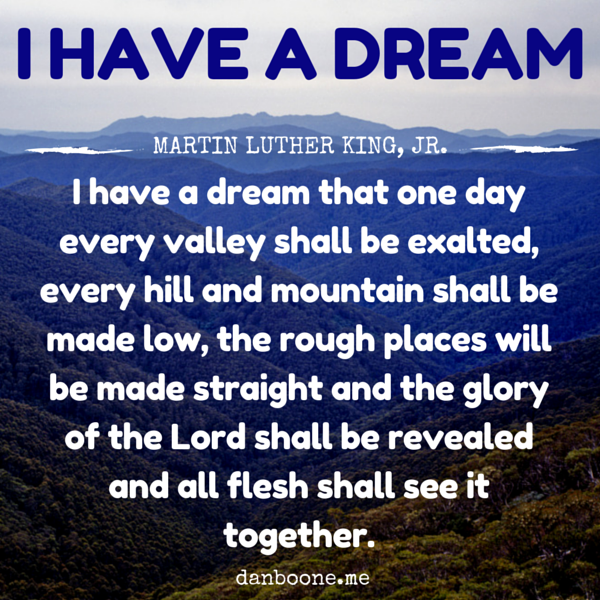 I have a dream that one day every valley shall be exalted, every hill and mountain shall be made low, the rough places will be made straight and the glory of the Lord shall be revealed and all flesh shall see it together. —Martin Luther King, Jr. Filed Under: Current Events, Social Justice Tagged With: Isaiah 40, Martin Luther King Jr. But there was one church, the Baptist Church on North Locust Street, which opened its arms to anyone who wanted to come. A brave pastor took a minority stance among his clergy peers. He resisted the downward pull of prejudice and welcomed blacks to worship with his white congregation. The Ku Klux Klan burned his church. There was a charred cross on the front lawn. It signified a very different kind of power than the power of Jesus’ cross. On this day of remembrance and thanksgiving for the ministry of Martin Luther King, Jr., I will be re-reading once more his Letter from a Birmingham Jail. These words, written on scraps of paper, have become a holy reminder to me that power is not the ability to harm others but the ability to endure suffering for the good of others. The power of Jesus is clothed in weakness, connected to the Cross, and viewed in a slaughtered lamb. The heroes of the coming kingdom will be people like that Baptist pastor who took a stand and Martin Luther King, Jr., who wrote liberty on scraps of paper. And while their power will be unimpressive in today’s dark world, the morning star will rise, a new day will come, and power will turn upside down.